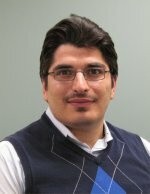 Congratulations to Dr. Mohamad Hejazi, research scientist at Pacific Northwest National Laboratory, who was appointed to the editorial board of the Journal of Irrigation and Drainage Systems Engineering in June 2012. As an editor, he will use his research expertise to provide reviews for manuscripts submitted to the journal. Hejazi works at the Joint Global Change Research Institute (JGCRI), a collaboration between and PNNL and the University of Maryland. Covering all phases of irrigation, drainage engineering, hydrology and related water management, the journal highlights watershed management, weather modification, water quality, and ground and surface water. The journal provides an open-access platform for new research developments and results, as well as engineering case studies and practical applications. Hejazi was chosen for his knowledge and body of research on the impacts of climate change and socioeconomics on future irrigation water demands, and the value of weather forecasts and climate information in irrigation modeling. At JGCRI, his research is focused on global hydrologic modeling, global and regional sectoral water demand models, water management/markets, and quantifying the effects of climate change, human activities, and climate policies on water scarcity. Hejazi is building a water market framework in the Global Change Assessment Model, a model used by the research and analysis communities to examine the evolution of the joint energy-ecological system, understand complex future challenges, and inform policymakers. GCAM is producing future projections of global and regional sectoral water demands and water availability estimates associated with future climate change scenarios. Prior to joining JGCRI, Hejazi was a postdoctoral research associate at the University of Illinois Urbana-Champaign, and a research assistant at the U.S. Geological Survey and the Illinois Water Survey.